Creator / Producers: Helena Harris and Posie Graeme-Evans. Executive Producer: Kris Noble. Director: Ian Munro. 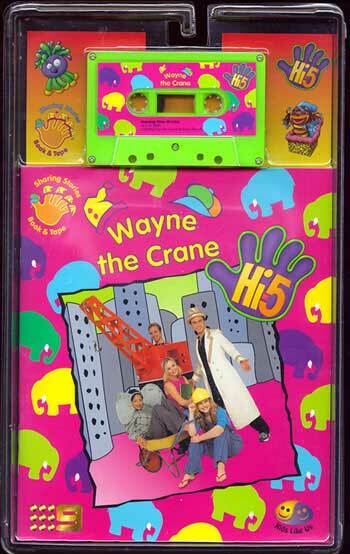 Hi-5 - Wayne the Crane. Sharing Stories Book & Tape. ISBN 1 66503 400 2. Book softcover. 24 pages. Cassette running time 10mins. The Five Mile Press Pty. Ltd. 2000. Music CD. Jump and Jive with Hi-5. No:496058.2. Sony Wonder. Music CD. HI-5 It's a Party. No:497848.2. Sony Wonder. 2000. Producer: Chris Harriott. Recorded at Trackdown Digital, Camperdown, Sydney, NSW. 08: North South East and West. 16: You Can't See Me. 32: North South East and West. Music CD. HI-5 Boom Boom Beat. No:5021772000. Sony Wonder. Music CD. 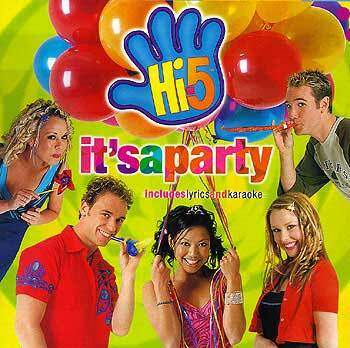 It's a Hi-5 Christmas. No:5043022000. Sony Wonder. 2001. Producer: Chris Harriott. Recorded at Sunstone Music, Enmore, NSW. 01: Santa Claus is Coming. 04: Rudolph the Red Nosed Reindeer. 05: Rockin' Around the Christmas tree. 07: Santa Wear Your Shorts! 08: Away in a Manger. 09: T'was the Night Before Christmas. 10: Dear Santa (A Christmas Wish). 12: Five Days to Christmas. 14: We Wish You a Merry Christmas. Music CD. It's a Hi-5 Celebrate. No:5083902000. Sony Wonder. Music x 2CD. 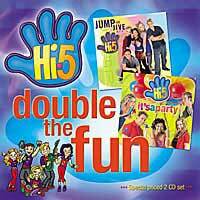 Hi-5 Double The Fun - Jump And Jive With Hi-5 / It's A Party. No: 5051582000. Sony Wonder.